"Spring sickness" is a disorder of daylilies, Hemerocallis, which becomes evident when new shoots have reached a few inches in height early in the growing season. One, two or more fans may be affected in a clump. These fans slow down or stop growing and frequently start to bend or twist as illustrated in the image to the left. Some leaves develop brown ragged edges and holes as they try to continue growing, although there are also fans which are unable to resume normal growth and remain stunted. While most plants survive, some have a difficult time getting over spring sickness and bloom can be adversely affected. 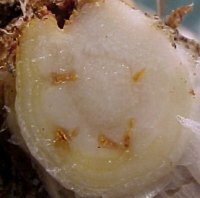 In addition to the readily visible leaf symptoms, a cross section of the affected daylily's crown will often show internal lesions as pictured in the next image on the right. Click on "Images" in the navigation bar to see more pictures of daylily spring sickness, and be sure to visit the image gallery. The images on these pages should help you to tell the difference between spring sickness and other aggravations, such as slug or freeze damage for instance. A task force of daylily enthusiasts has been formed to study this problem. What actually causes spring sickness is not yet proven, although we have been able to eliminate some previously suspected factors and identify some possible culprits, including bulb mites as illustrated in the next image, lower left. This picture shows daylily leaves with the typical ragged margins of spring sickness, on which two bulb mites were observed and photographed using magnification. 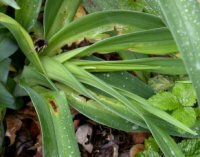 It is also possible that a fungus is involved in spring sickness in some way, the leaf streak fungus Aureobasidium microstictum being commonly isolated from daylilies suffering from spring sickness, but this organism is believed to need an injury before it can infect. See our What's New page for the latest test results in our quest to identify the causative agents. We invite you to check out our pages and let us know what you think of the site or share your observations on spring sickness, and if you have a question not covered by our Frequently Asked Questions page, there is a feedback form provided for your use. Spring sickness is not seen in every daylily collection so, if you are just starting out and have stumbled upon these pages, don't be discouraged from growing these beautiful plants! Read and bookmark the pages here for future reference, and then head for the "Daylilies in General" section of our Links page where you will find other sites covering a wider range of daylily topics. ©copyright 2001-2009 Top image above by Michael Bouman, lower three by Susan Bergeron. All other images on this site by Susan Bergeron except where stated otherwise.